ALMOST everyone calls the dirt path undulating around the Central Park reservoir the “runners’ track.” But ever since the ugly chain-link fence from the 1920s was replaced with a reproduction of the original in 2003, the path has often been crowded with walkers, dog owners and even cyclists jockeying for position. Runners resent the new arrivals on their course — but is it theirs? 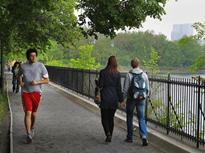 The intentions of Olmsted and Vaux regarding the path around the reservoir at 90th Street are unclear. On the one hand, the rim of the rectangular lower reservoir between 79th and 86th Streets (now demolished and replaced by the Great Lawn) was made off-limits by a picket fence. Access was jealously guarded by the board in control of the aqueduct and reservoirs. There were other users. An Australian heavyweight boxer, Tom Lees, prepared there in 1889 for a match in New York against Jack Fallon, “The Brooklyn Strong Boy,” according to the National Police Gazette. After a breakfast of three mutton chops and a soft-boiled egg, Lees kept in fighting trim with a run of three miles around the reservoir. Australia lost to Brooklyn. In 1913 The New York Sun indicated that regular walking there had been considered a “trifle freakish” in the 1890s, but that now hundreds took “their constitutionals,” paying “no heed to weather.” Runners could feel cramped; in 1923 the bridle paths were closed three nights a week for long-distance runners training for the Olympic Games. That summer, the United States did not place in the 10,000-meter run, but a New Yorker, Jackson Scholz, took the 200-meter event. It was not just walkers and runners. In July 1923 scores of people on what The Times called “the promenade” saw a household servant, Elvira Prange, struggling in the water off 90th Street. A mounted policeman, John D. Tracy, jumped the fence on horseback and saved her. Miss Prange said she had tried to drown herself because her mother had not been writing regularly from Germany. Originally, the upper reservoir had been surrounded by a low iron fence like the one in place now. This was removed in 1926 amid many protests, replaced by a tall chain-link fence to discourage littering in the water. In a letter to The Times, Helen Kobbe objected to the “unsightly” fence. The “soft beaten path,” she said, was “a favorite walk for many people, from the professional athlete to the misses and children.” From that time onward, praise like Cook’s for the reservoir path seems to dwindle. Jogging around the reservoir has increased, so much so that one-way signs were posted, implicitly ratifying its character as a running track. But after the tall fence was replaced in 2003, walkers flooded back, and the signs make no sense for them, as they rarely go all the way around and ought to be free to amble in any direction. On a recent early weekday evening in T-shirt weather, a walker on a 10-minute stroll around the southerly part of the reservoir passed — or was passed by — 87 runners; half a dozen walkers; nine people going against the signs (one of whom was a runner); and half a dozen people just standing at the fence, looking out over the water. There weren’t any nasty looks and everyone had enough room — just enough. But in warmer weather, on a weekend, it is not remarkable to see the same number of runners competing with a lot more nonrunners: strollers, a rolling suitcase, clumps of families walking erratically, children darting around, even a few blithe cyclists. It’s like hurdles rather than running, except that the hurdles are moving. The walkers feel the Olympics have invaded, and the runners feel their refuge is being destroyed. It’s as if the model boaters had to share the 72nd Street pond with a wave machine for surfers. Central Park was conceived as an uplifting, pastoral landscape for contemplation and relaxation. Over time, sports have slowly acquired special-use areas: baseball diamonds, tennis courts, playgrounds, bicycle lanes. A question: can you contemplate nature while batting cleanup, playing doubles, or trying for a 10-minute mile?